Following a grand jury indictment of Gov.Rick Perry on charges of abuse of power and coercion, Texas Democrats on Friday jumped to paint the longest-serving governor of the state as the standard-bearer for a corrupt party. The announcement of the indictment breathed life into Texas Democrats who pounced on the governor’s actions and are aiming to make corruption a key issue in the upcoming general election. Democrats’ attacks on Perry and Texas Republicans come less than three months ahead of an Election Day in which they are hoping voters will elect a Democrat into statewide office after a two-decade electoral drought. The Texas Democratic Party led the response to Perry’s indictment, wasting no time callingfor his resignation minutes after it was announced as part of an investigation into his veto of funding for the state’s public integrity unit. Democrats had dogged Perry for months after an ethics complaint was filed against the governor, alleging he had improperly used his office to deny funding to the public integrity unit, which is housed in the Travis County district attorney’s office and investigates government corruption. Republicans have said the investigation was politically motivated. Perry threatened to withhold $7.5 million in funding from the unit if District Attorney Rosemary Lehmberg did not resign after pleading guilty to drunken driving last year. Perry eventually vetoed the state budget’s funding line item for the unit, and critics quickly accused him of using his veto power for political purposes violating state law. He also attempted to connect Texas Attorney General Greg Abbott, the Republican candidate for governor, to Perry’s indictment, questioning whether he had “advised or condoned” his actions. 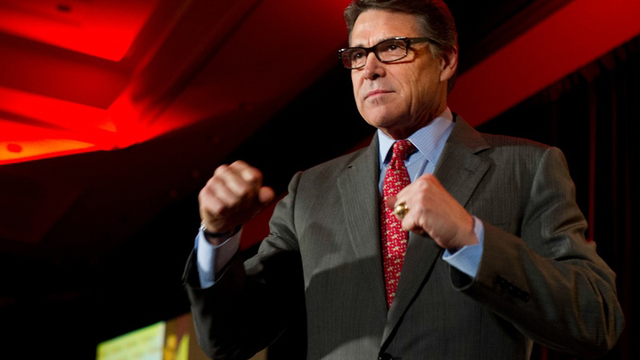 Battleground Texas, the Democratic group working to make the state politically competitive, was quick to dismiss Perry’s prospects as a potential presidential candidate in 2016 and began using his indictment to raise funds. “Rick Perry's indictment for abuse of official capacity and coercion is just the latest example of Republicans failing to work for Texans,” Jenn Brown, executive director of Battleground Texas, said in a statement. But Steve Munisteri, chairman of the Republican Party of Texas, dismissed the idea that Perry’s indictment could affect other Republicans on the ballot in November because he said voters would see the political motives behind the investigation. “I think most people are going to see it for what it is,” Munisteri said. Other Republicans who have also been indicted or violated the law have been unaffected at the ballot box. Kay Bailey Hutchison’s indictment on charges of misconduct and evidence tampering as a Texas treasurer didn’t jeopardize her political future. The indictment came in 1993 – four months after she won a special election for U.S. senator. A jury acquitted her in 1994, and she remained in the Senate for nearly two decades. After his indictment on charges including money laundering and alleged campaign finance violations, Tom DeLay, a former Republican majority leader of the U.S. House, resigned in 2006 after being pressured by his fellow Republicans. He was convicted five years later. His conviction was overturned in 2013 by an appeals court. More recently, state Sen. Ken Paxton easily won the Republican primary for attorney general against state Rep. Dan Branch after he was found to have violated the Texas Securities Act by soliciting investment clients without being registered as required by law. He is facing Democrat Sam Houston — who was quick to highlight Paxton’s violations on Twitter after Perry’s indictment — in the general election. “This is yet another test for the [Wendy] Davis campaign and the Democratic Party over whether they can take advantage of an opening,” Henson said. But state Sen. Wendy Davis, the Democratic gubernatorial nominee, treaded lightly in her statement in response to Perry’s indictment. Julián Aguilar contributed reporting to this story.